Learn what is the meaning of hybrid SIM card slot in mobile phones. 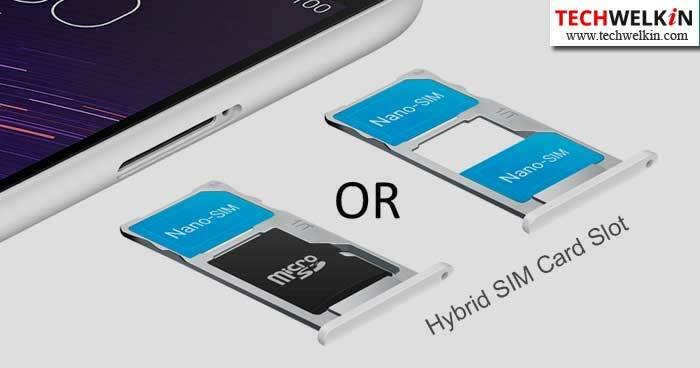 A number of smartphone makers are offering this combination slot for SIM card and SD card. Hybrid slot tray gives you an option of how you want to use it. Also there are hacks available for the hybrid slot. Almost everyday new mobile phones are landing in market. Every phone tries to beat competition by offering more and more new features to customers. Nowadays, hybrid SIM card slots are becoming a trend in some of the popular smart phones. A friend recently bought Asus Zenfone 3 which came with such a hybrid slot. But he had no idea what it is. So, he asked me the meaning of hybrid sim card slot and thus I looked into it. In this article I will discuss what is a hybrid SIM card slot, its feature and its advantages and disadvantages. a single SIM phone with expanded memory. Actually speaking there is no advantage to the user whatsoever except that you do not need to open the phone’s hard case anymore. You can simply slide in the tray with the SIM and microSD. This gives you the convenience of changing your phone’s SIM configuration very easily. But hybrid slot gives a clear advantage to the phone’s manufacturer. For the phone manufacturers, hybrid slot saves space. This saved space will help produce a slimmer phone — or maybe with a larger battery, additional RAM or a powerful camera. So, instead of removing existing features to accommodate new features, phone manufacturers have opted for the additional slot and coupled it with the dual SIM tray. As a manufacturer they are offering you both — dual SIM option as well as extra storage. The above image displays how the hybrid SIM card slot is used in a mobile phone. The Hybrid SIM Card slot feature does not allow you to use the features together. That’s obvious! You can use it either as a dual SIM or as a single SIM + microSD. This feature limits your phone’s functionality and that is the major disadvantage of hybrid SIM slot. It would have been advantageous to the user if a third slot was also provided. In that case you could have had a dual SIM phone with an expandable memory. Following is the list of some of the smartphones that offer hybrid SIM slot. Users who like to have a SIM for voice calls and a separate SIM for data usage along with extra storage, they will not like the hybrid SIM card feature. There are hybrid SIM card hacks available that may meet your requirement. However, those are not easy or safe solutions. Many popular smartphone models are available with this feature but instead of buying a phone because of its popularity, it is better to buy one that meets your requirement. hi, Can u suggest some good phones in the range Rs. 12000 to 17000 with good battery life, good features and specially without hybrid sim slot( dual sim +memory card slot ). what do u think about redmi note 5 pro ? hoping for your reply as early as possible. thank you. Do u think Redmi A1 is a good choice??? hi, Can u suggest some good phones in the range Rs. 10000 or below with good battery life, good picture quality and storage without hybrid sim slot and without non removable battery. hoping for your reply as early as possible. thank you. Hi Roshni, there is no “perfect” and yet inexpensive phone. One has to do a bit of trade-off on one feature or the other. But In your price range, Samsung On7 Pro could be a good choice.